You can't use a mecate without slobber straps, so we offer some to fit every taste. We offer our slobber straps in the same English Bridle leather as our headstalls and they are available in the same colors; black, dark brown, burgundy, medium brown, chestnut and tan. We can also make them out of harness leather to match our harness leather headstalls and are now offering them in saddle skirting leather as well. Some styles, namely the narrow button-on style, are available in latigo only. Shaped, lined and stamped slobber straps are also available by special order. All of our slobber straps have a 5/8" hole for the mecate unless a larger or smaller hole is specified. They also have a long slit in addition the the hole to allow the mecate some extra room to slide through. We hope you enjoy the pictures below. Please click on the photos to enlarge. Our straight, unlined slobber straps are reasonably priced at $20 for chestnut or tan. As shown here in dark brown (or in medium brown, black or burgundy), they are $23. They measure 8-1/4" from fold to tip and 7-1/4" from fold to center of the hole. Here is another version of our basic straight and unlined slobber strap. This pair has a beaded border (the raised line) framed on both sides by a large border stamp. Price is $37 per pair in tan and chestnut and $40 per pair in black, dark brown, medium brown and burgundy. 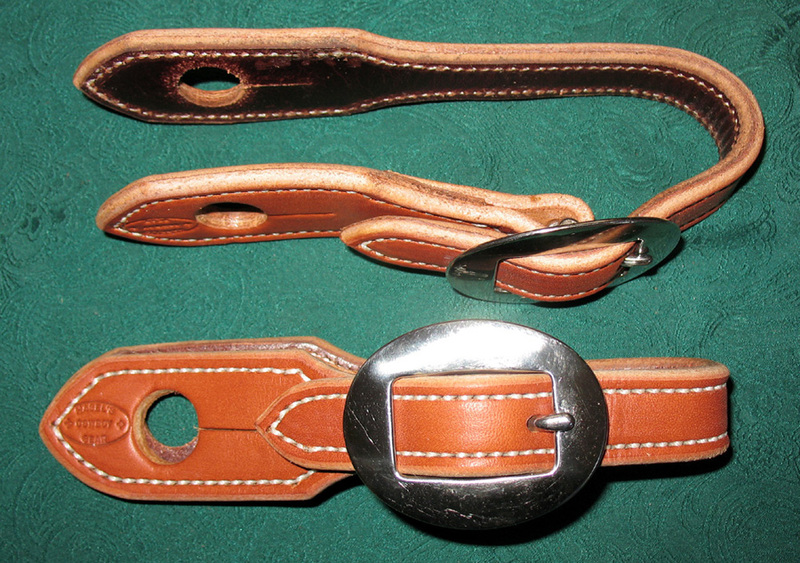 We began making these buckle-on slobber straps at the request of a client. They are an alternative to our button-on design and are easier to unfasten from the bit. They make switching a mecate from bit to bit very easy. These are shown with #132 cart buckles to match the buckles on our headstalls, but we offer them with a slightly narrower buckle as well. Buckles are available in brass, chrome and stainless steel. These are 1-1/4" wide and 9" long from fold to tip. Tan or chestnut slobber straps are $47. Black, dark brown, medium brown and burgundy colors are $52. This is a slight variation of the above buckle-on slobber straps. They are 1-1/4" wide except where they go through the bit (that area is 3/4" wide) and 8" long fold to tip. These are shown with stainless steel #132 buckles, but they are available with brass or chrome buckles also. In tan or chestnut, these are $46. If made in black, dark brown, medium brown or burgundy colors, they are $51. We call this variation of a buckle-on slobber strap Slick after a horse of the same name. I came up with this pattern for a memorial loop rein made with Slick's mane hair. Without Slick we wouldn't have our Slick slobber straps. 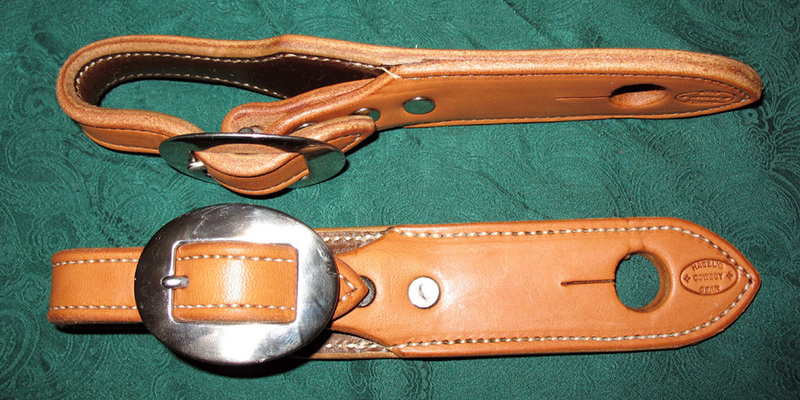 These are shown in chestnut English bridle leather and feature 3/4" stainless steel #132 buckles. All measure 6-1/4" long fold to tip; 5-1/8" from fold to center of the hole. Tan or chestnut slobber straps are $35. Black, dark brown, medium brown and burgundy colors are $39 Buckle choices include chrome, stainless or brass. This is the original pattern of our button-on slobber straps. My dad came up with this sometime around 1992 or '93. They allow the rider to use a mecate on several different snaffle bits without every untying the mecate from the slobber straps. These are made with burgundy latigo and are 8" long from fold to tip. Here is a fancier version of our latigo button-on slobber straps. These use 5/8" sterling overlay ball conchos instead of latigo buttons. They are 8" long fold to tip. These tan English bridle leather slobber straps are stamped with a very small arrowhead basket stamp. 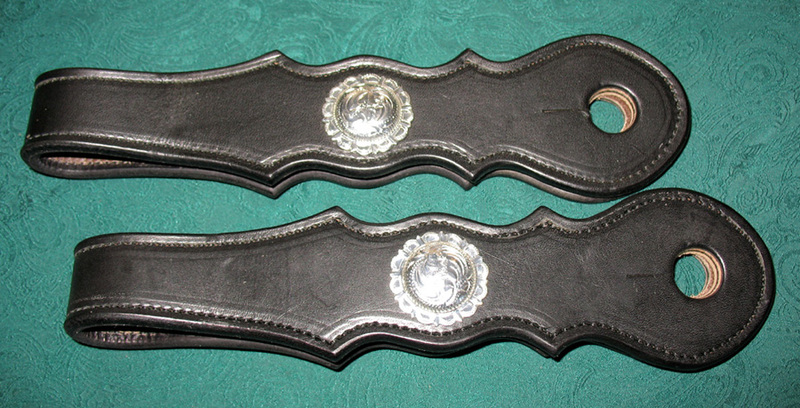 The scalloped edge 1" sterling overlay conchos add a little shine. This pair made using our Arvada pattern and is 7" long from fold to tip. These smooth black Sheridan pattern slobber straps are dressed up with 1-1/4" pico edge silver plate conchos. The straps measure 9-3/4" long fold to tip. Straight cut narrow latigo button-on slobber straps are especially handy for attaching mecates to side pulls or short shanked snaffle bits. They also give a regular snaffle bit and mecate set up a new look. These are only available in latigo leather. Burgundy latigo is always available, dark brown and black latigo straps in this style are subject to leather availability. Price is $33 per pair as shown and $35 for burgundy, dark brown and black with dyed edges. This is our Buffalo style of shaped slobber strap. This one is plain, lined chestnut English bridle leather. This style and all of our other plain, lined slobber straps are $32 in tan and chestnut. Black, dark brown, medium brown and burgundy plain, lined straps are $35. 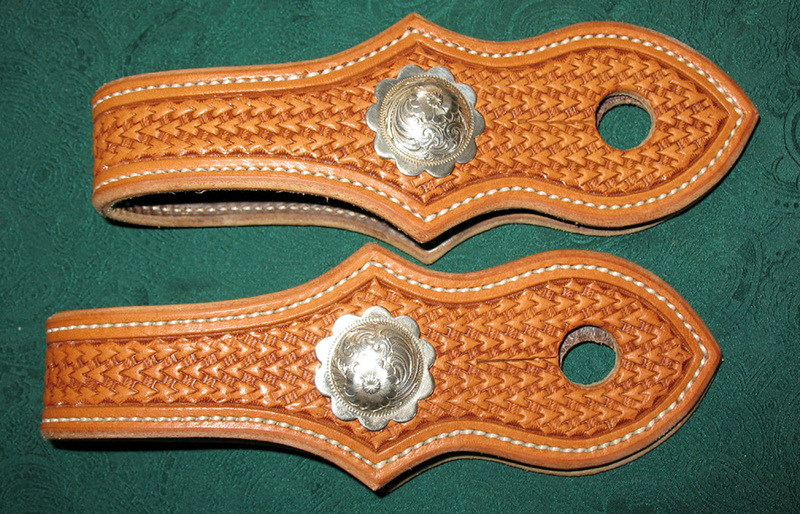 This is a pair of our Cheyenne slobber straps in saddle skirting leather that has been stamped and lined. The stamping pattern is an arrowhead basket done with a small basket stamp. These are $58 as shown or in tan or chestnut and $61 in black, dark brown, medium brown and burgundy. A bit of silver can really fancy up a pair of slobber straps and these are a good example. 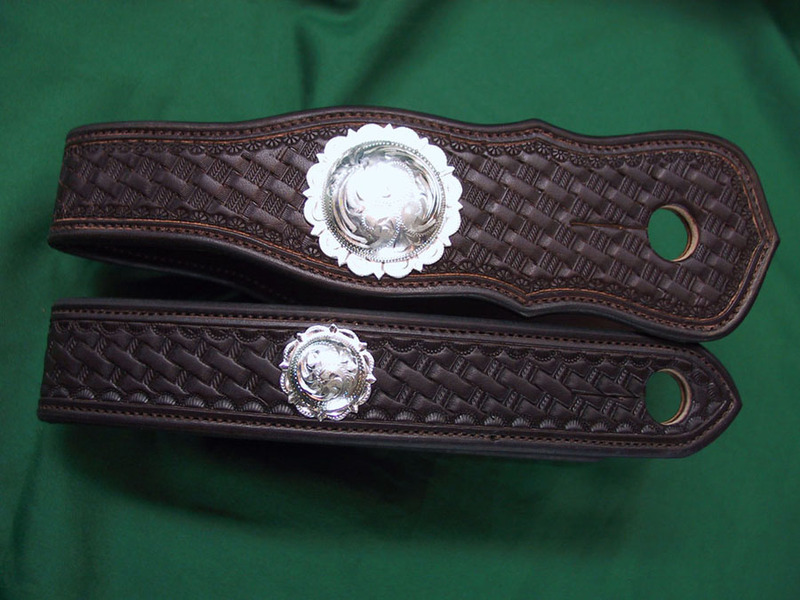 At the top is our Wyarno style with a large basket stamp and an 1-3/4" silver plate concho. Note the double rope center of the basket stamp. The slobber strap at the bottom is a dressed up version of our straight strap. It also features a large basket stamp and the concho is silver plate and 1" in diameter. Both of these are dark brown English bridle leather that has also been lined and stitched. 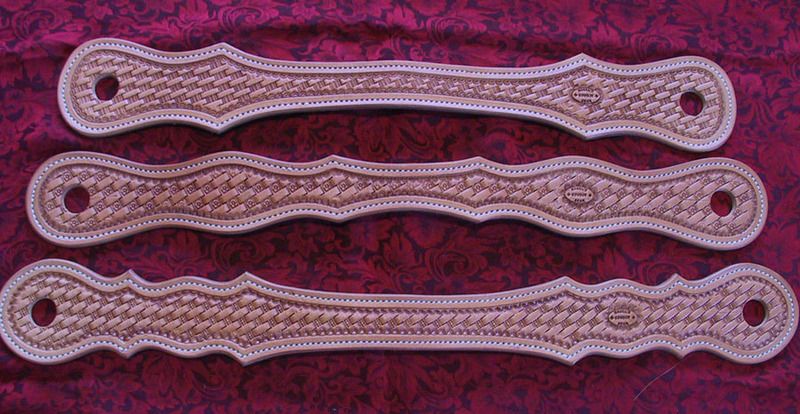 Here are three different styles of shaped and lined slobber straps, all made out of saddle skirting. At the top is our Sundance style with a large double rope basket stamp. In the middle is the Cheyenne style with a flower center basket stamp. Our Sheridan style is at the bottom. It features a large ball center basket stamp. These slobber straps are $46 as shown and $49 for black, dark brown, medium brown and burgundy with dyed edges. This is a close up of the above three slobber straps.